Have you always wanted to drink coffee out of a waffle cone? Your answer is probably "yes," because why wouldn't you want to combine three of the best things in life (coffee, ice cream cones, and chocolate)? 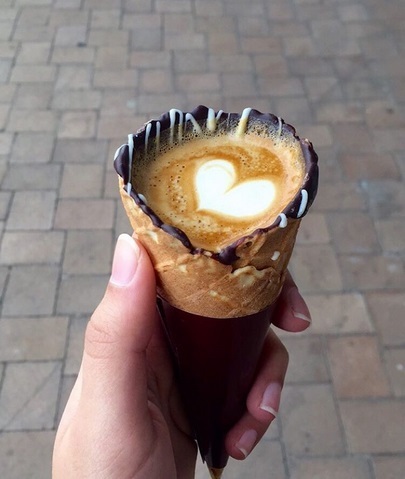 Hailing from The Grind Coffee Company in Johannesburg, South Africa, coffee in a cone is the latest food trend that has people traveling from all over the place, and for good reason. "We used the cone as a way to become an Instagrammable product. When people come in they take a selfie and tag #coffeeinacone," the man behind the concept, Dayne Levinrad, told CNN. It's true: everyone who orders the coffee in a cone from The Grind seems to adapt the "pics or it didn't happen" mantra because the Instagram opportunity is way too good to pass up. Bottoms up!